The stylish Finnish saunas-style sauna invigorates the interior and adds a sparkle to every garden. 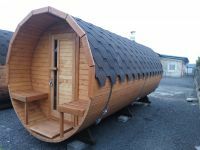 The Finnish sauna is also called Barrel Sauna. At the end of the 20th century, Finnish saunas began to appear in gardens, cottages, family houses and the hotel sphere for their unique style, minimal placement requirements and quick installation. 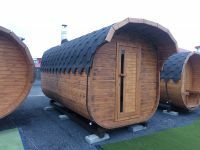 Thanks to its unique shape, which minimizes the volume of heated air, the barrel sauna has become one of the most popular types of outdoor saunas in many countries around the world. Sauning in nature, overlooking the garden or the pond is a real experience that also strengthens your immune system and gives you health.